Think about freshly boiled rice and the memories of its rich taste would tempt us instantly. 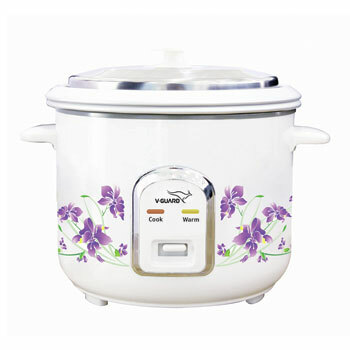 It is exactly this freshness that V-Guard’s VRC 1.8 (2P) range of rice cookers would bring to your dining table. This advanced product comes to you with a double layer outer body that complements its premium stature and quality. It is equipped with Keep Warm function that helps to keep rice warm for a longer period of time and offers the advantage of coming with an additional cooking pan that gives you added options. This product also fosters faster cooking and provides a 5 year warranty for heating plate.